“In Sea Prayer, the author brings to the fore, in a subtle and restrained manner, the predicament of parents in such a miserable and tumultuous world,” writes Nayan Basu. Few years back, in 2015, an image of a little boy, fully clothed, lying face-down on the shores of in the Mediterranean Sea made global headlines. That little boy, Aylan Kurdi, and his family were Syrian refugees trying to reach Europe amid the European refugee crisis. The little boy didn’t make it. The image of the boy become a representation of the plight and sorrow of refugees around the world. The incident affected Khaled Hosseini so much, that, what came out of it is his latest book, Sea Prayer. In this book, the author brings to the fore, in a subtle and restrained manner, the predicament of parents in such a miserable and tumultuous world. 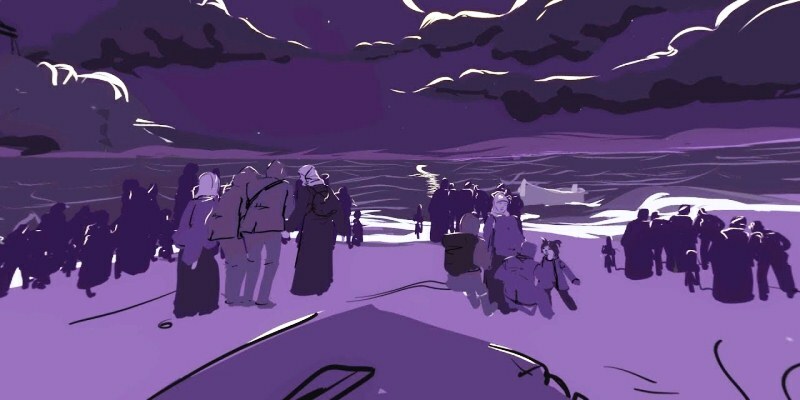 Like all his previous books — which are emotional narratives of people displaced from homes because of war and riots — this book too cries out for the life and safety of refugees fleeing from their own in search of a new life. The book is written in form of a letter from a father to his son, Marwan, on the eve of their journey towards a new life, as they are set to embark on a new life leaving behind their homes and everything they have called their own. Leaving home is never easy. And it’s tough when you know you have a big sea in front of you which you will have to cross to reach a safer place. However, staying back in your own country, which is now turned into a battlefield, is not an option either. They must abandon it for life. In his letter, the father fondly reminisces the glorious days of his home at Homs, Syria, and how life was in the country a few decades ago. He recalls how the summers were filled with happiness and morning were full of life – there was so much joy all around the city of Homs. There were peace and harmony and people of all religions lived happily and they gathered every evening to share stories and food. Those were happy times. The father laments that Marwan might not remember the happy moments at Homs as he was too small then. The only image of Homs his son will carry his entire life is that of war, bombing, bloodshed and gore. Every child deserves a safe and healthy upbringing. But what can a father do when his country, in the current situation, can only promise burials, starvation, and bombs. Even though the future looks bleak — unsure if they will ever be made to feel welcomed at the new place, unsure if they will ever make it to the other end — a father can never lose hope because he has with him the most “precious cargo” with him (his son). He, however powerless he feels, hopes they will make it to the other end, and God will steer them to a safe place. the most precious there ever was. I pray the sea knows this. The powerful expressions and phrases used in the book can leave a reader emotional at the end. And the expressive illustrations by Dan Williams adds a more life and feel to words. Nayan Basu is a Learning Experience Designer by profession and Blogger by passion, with a penchant to read, write and travel.